(Aigaforum) May 4, 2014 - If you have been following us over the years you know by now how much we really like to see a maturing and responsible opposition party in Ethiopia. You may have heard us before, but, we will tell you again, Kinjit damaged our hope to see a vibrant and responsible opposition when it declined to take its seat in parliament with almost half of the available seats! Since then we have been a staunch advocate for a change in the opposition camp. We believe then and now in the saying you cannot teach an old dog a new trick! Thus, did all in our power, to inform and inspire, the new generation that Kinjit and its splinters are up to no good. We think by in large most Ethiopians are aware about Kinjit and some of the left over organizations who are still trying to become relevant today. Even though Andinet and Semayawi Party held somewhat a successful public demonstration in Addis Ababa and elsewhere in Ethiopia the public by in large is not interested in them. The turnout was nothing compared to what Kinjit used to garner before it was consumed with its own hate filled agenda. Kudos to the City Government of Addis Ababa to allow such demonstration amid the frenzy of public works in the city of Addis Ababa and the many visits by high level foreign officials. It shows how much Ethiopia has come forward to contain and overcome the challenges of democracy that usually follows such demonstration. We applaud! Talking to an eye witness, Andinet's public demonstration held on May 4th 2014 was very successful compared to the one held by Semayawi's party at the end of April 2014. These two organizations are splinter of the then Kinjit and still carry the bad attributes of Kinjit. We were informed even though the two parties tried to join their efforts for a wider public support Andinet was in no mood to carry the burden of Semayawi's ill advised support for religious extremists agenda. In fact we were told during Andinet's public demonstration Semayawi supporters were told to leave and not mix with demonstrators. Bravo Andinet, a step in the right direction we say! There should be no room for religious zealots in politics. It is a bad mix learn from Egypt and Afghanistan! We asked a very reliable person what is going on in Ethiopia these days? And what he told us is this- Ethiopia is passing through a critical phase in its quest to become fully a democratic and a developing country . The country is being tested right now. 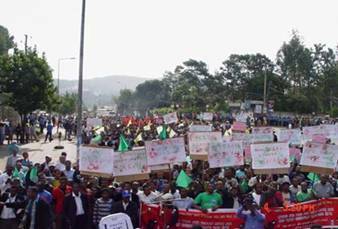 The recent disturbance in Ambo and elsewhere in Oromia region is a sign the country ought to take seriously. No one should undermine the exiled opposition forces as well as some of the disgruntled folks at home desire to derail the relative peace in the country. Sec Kerry's visit was a coincidence they could not miss to exploit. Fortunately everything is under control and Ambo is at peace and the community has resumed its normal public life. Our source told us there was in fact a big wedding in the city the other day. The extremist oppositions were trying hard over the years to make the country ungovernable and un peaceful but they have failed. Today they are trying to paint simply a make believe image of the country as ungovernable. Even Sec John Kerry attested how much Ethiopia has come forward despite some of the human right challenges here and there. I hope Sec Kerry will use his eye witness account instead of the usual DC based extremists account of events for the next year's State Dept human right report on Ethiopia! For a change he should use eye witness and not extremists propaganda material as the sources! Ben of Ethiopia first in his latest "ben's point of view" shared his discourse with someone on the Anole monument. To be honest we question the motive of anyone least a politician who is interested promoting such issues. Who is to say the recent misguided violence in Ambo is not an outcome of such campaign? Ethiopia's past history is full of wrong doings as much as it is full of glory and valor. Atse Minilk may have been brutal king and the dysfunctional oppositions trying to glorify him may be too annoying but an astute politician leading Ethiopia today must be smart enough to know what the people's priority must be in order to defeat the number one priority! if we have to build a monument let us build the biggest monument that will live forever no matter who comes and goes - a monument of the new Ethiopia that is peaceful and poverty free!